More than 50 years ago flying started in the Innviertel. In 1958, Dr. Otto Paul bought a plot of land for the SFC Ried-Kirchheim, and 2 years later it was opened with a big ceremony. Shortly afterwards the SFC Ried was registered as club in its own rights. Thanks to the unfailing efforts of the founding members the airfield could be steadily enlarged and the infrastructure improved. The first plane was bought, a second hangar built, and the airstrip lengthened, to mention but a few points in the history of the club. In 1987 the runway was tarmaced and thereafter flying was possible even in the wet season. It has always been of great concern to provide the members with modern and well-equipped airplanes. Thus the fleet park has been steadily modernized and enlarged, also to offer the continually rising membership sufficient opportunity to practice their hobby. Today the club has over 200 members from the area of Upper Austria and Salzburg. The most recent highlight in the history of the club is the new tower and the restaurant, which were both built to accommodate the World Championship. 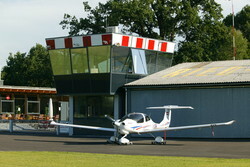 So now all visitors to the airfield can enjoy Italian and local specialties in the restaurant “Fly Inn”. The pilots can enjoy modern equipment for briefing and flight planning in their own briefing room in the tower. Security plays a big role at the airfield – there is a modern security system with cameras and transponders. Apart from flying, the club places great emphasis on taking care of contact with the neighbours and the surrounding communities. That is why there are regular events and festivities on the airfield where all the inhabitants of the neighbouring villages are invited. It was a great honour for the club to organize the European Championship (2003) and the World Championship (2008). For two weeks the Innviertel became the centre of precision- and navigation flight. Thanks to the support of the members these events turned into unforgettable experiences.